Uglyworld #1839 - Right Flippers Green - (Project Cinko Time - Image 47-365), a photo by www.bazpics.com on Flickr. 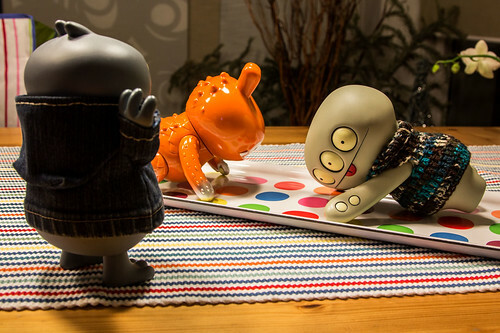 Babo: "Wage, lefts foot blue"
Babo: "Cinko, right flippers green"
Cinko: "Is you havings a laugh Babo?" Babo: "Nopes, right flippers green it says, hands up to god"
Cinko: "How the hells can I possiblies reachers green withs my right flippers!" Wage: "So, you forfeiters the games then buddy, huh?" Cinko: "No ways, I will makers it if it's the lasts thingymabob I ever does!"